Do you need to manually add the UA tracking code to your MonsterInsights plugin? This guide will show you how. Step 1: Install and activate the Code Snippets plugin in WordPress. For detailed instructions on how to install a WordPress plugin, see the guide: How to Install a WordPress Plugin – Step by Step for Beginners. Step 2: Navigate to Snippets > Add New. Step 3: Add a descriptive title such as Manual UA Code MonsterInsights. * Manually set a custom UA code in MonsterInsights. * @param string $ua The current UA code. $ua = 'UA-123456-1';// Replace this with you UA code. Step 5: Be sure to replace that UA code with your own Google Analytics UA code. If you aren’t sure what your UA code is, please see the first step in our guide: How to Fix Wrong Google Analytics Profile Selected in Settings. That’s it! 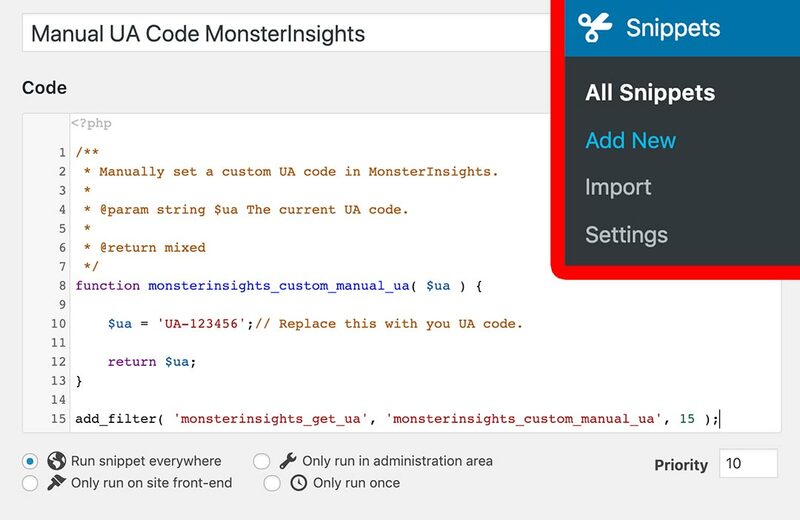 Now you know how to manually add the UA code to your MonsterInsights plugin.